Details for the soundtrack to Nowhere Boy, the forthcoming John Lennon biopic, have been announced. Original Soundtrack Music From and Inspired By... is to be released as a double-CD set and digital download on 14 December 2009. The first CD features songs used in the film; the second supposedly contains "music inspired by...", although "music that inspired Lennon" would be more accurate. With a screenplay by Matt Greenhalgh (best known for his screenplay for Anton Corbjn's Joy Division biopic, Control), Nowhere Boy is Sam Taylor-Wood's directorial début, and recently closed the London Film Festival to critical acclaim. The film stars Kristin Scott Thomas as Aunt Mimi, Anne Marie Duff as Lennon's mother Julia, and features Aaron Johnson as the young John Lennon. It will be released on 26 December 2009. 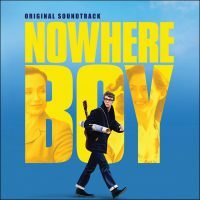 Sony Music is pleased to announce the CD and Digital Download release of the soundtrack album of the year, "Nowhere Boy" – the critically acclaimed hot new film biopic about John Lennon's teenage years which led to his musical career from the Quarrymen to his early relationship with Paul McCartney and George Harrison when the Beatles first set off to Hamburg. Featuring the directorial debut of Sam Taylor-Wood and screenplay by Matt Greenhalgh (who wrote the script for the 2007 Joy Division film Control), the film recently closed the prestigious London Film Festival and to rapturous applause and rave reviews, prompting comparisons with the runaway success of Slumdog Millionaire. A member of the Young British Artists movement, Sam Taylor-Wood is the British conceptualist artist whose work includes photography and cinema. In 1997 she was nominated for the Turner Prize and won the Illy Café Prize for Most Promising Young Artist at the 47th Venice Biennale. Nowhere Boy is her first full length feature as a film director. Following with the success of the Beatles re-masters and the Rock Band game earlier this year, the timely release of this fabulous John Lennon motion picture soundtrack makes for a worthy addition to the collection of any dedicated Beatles fan or anyone who is interested in the history of the rock'n'roll and feature films. I enjoyed this music, and I thought the soundtrack was fantastic! However, there is an instrumental, orchestral song that is played on several occasions throughout the film. I’m a fan of this type of music, and I have searched on several occasions for this song. It’s the strings playing a 1-2-3 pattern, a really sad or dramatic sounding run. If anyone could help me out, it would be appreciated immensely! I believe a specific part in the movie for this song, or it could simply be a short loop of strings, is when he is walking in the field by himself.